As our children are pushed harder than ever to perform so that they will one day "make the grade" in the adult world, parents are beginning to question the wisdom of scheduling childhood's basic pleasures. In Reclaiming Childhood, William Crain argues that rather than trying to control a young child, the best a parent can offer is "a patient and unobtrusive presence that gives the child the security and the freedom to explore the world on her own." He examines how children find their way to natural development through experiences with nature, art, and language, and makes a strong case for child-centered education—a movement that may be under fire, but that is very much alive. 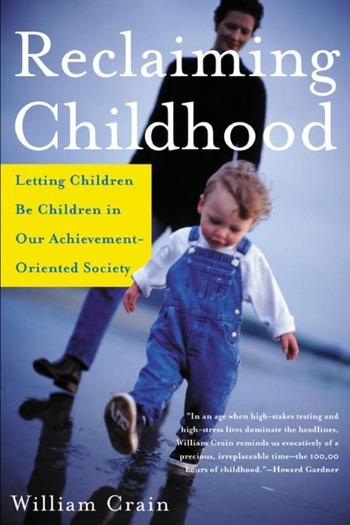 William Crain, Ph.D., is a developmental psychologist, author, and social activist. A professor of psychology at the City College of New York, he is the author of a major textbook in the field. His 1997 article in Montessori Life magazine, "How Nature Helps Children Develop," was a finalist for the 1998 EdPress Award for excellence in educational journalism. He lives in New York City.